Synopsis: Which feature is your favorite? 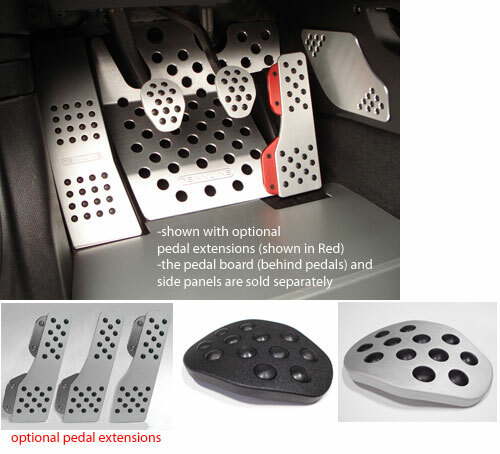 Rennline’s rubber grip aluminum pedal covers are the ultimate interior upgrade for any performance automobile. No other pedal on the market gives you the flexibility of adding and removing throttle extensions and or lifter plates to fine tune your individual ergonomic preference. Rennline has taken this pedal design to the next level by utilizing rubber grips that can easily be replaced if needed. Each pedal set comes with 8 replacement rubber grips, which can be purchased separately at any time. Rennline pedal sets are constructed of anodized aircraft grade aluminum with full chamfered edges and all stainless steel hardware. Throttle extensions (shown in red in pic) are not included but are available separately as an option in Red, Silver or Black. Available for 6 speed or Automatic transmissions.